The question on everyone’s mind is, “Will Faye Wong (王菲) return to her career?” And this would be quickly followed by, “If yes, when?” The problem, though, is that she hasn’t said yes so the second is moot. But the first is still up in the air. When Faye arrived at Hong Kong airport on May 21 to participate in the Buddhist ceremony for the Sichuan earthquake victims, reporters swarmed around her. She was apparently in a friendly and receptive mood, smiling and responding to reporters’ endless queries. When asked the inevitable question, she didn’t say anything but responded with a smile and a light laugh. Speculation regarding the significance of this response is running rampant. The bottom line is that Faye has not said “No.” And what does that mean? I don’t know about you, but I’m an optimist. 4. I’m sure this choice is going to be controversial. But here goes. For my 4th favorite Faye Wong(王菲) minor video, I’ve chosen this version of “Eyes on Me,” uploaded to YouTube by StuffysFaye almost exactly a year ago. This version was shot on the roof of a Hong Kong hotel [on 10 Dec 1999] as part of the 41st Japan Record Award TV spectacular, which aired in Japan on New Year’s Day 2000. 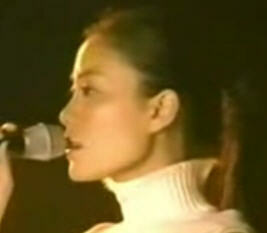 Faye won the Asian Music Award for 1999, which is given to the best Asian singer outside of Japan. The song was commissioned by Nobuo Uematsu for Final Fantasy VIII, for a rumored $1 million USD. “Eyes on Me,” composed and produced by Uematsu, also won Song of the Year (Western Music) at the 14th Annual Japan Gold Disc Awards for 1999. I say “controversial” because many die-hard fans reject Faye’s non-Chinese songs. I’ve never fully understood why. I actually love her English and Japanese songs. And “Eyes on Me” is one of my favorites. This is a tour de force as far as I’m concerned. Here, we hear the amazing range and flexibility that Faye attains without any apparent strain. The overall effect is magical, almost superhuman, an effortless flight, a soaring of the human soul. But what makes this video special is Faye’s appearance. In a simple outfit with her hair pulled back in a ponytail, she literally glows, radiating an aura of elegance and energy. I first discovered Faye in the summer of 2005, when I rented Chungking Express at the local Blockbuster. I was blown away by Faye and the voice that sang the Cranberries’ “Dreams” in the movie track. I had no idea they were one and the same until I watched Quentin Tarantino’s closing comments about the film. To make a long story short, I later realized that I had seen Faye much earlier, in 2000, when I watched a part of the 41st Japan Record Award show. (Back then, I’d never heard of her and was totally unaware of the body of her work.) At the time, I was struck by her physical beauty and amazing voice, but I didn’t follow up. If I had, I would’ve been there to experience all of Faye’s 2000-2005 albums, concerts, films, appearances, etc. as they were being released or performed. As it is, my experience of Faye’s performances are all after the fact by way of recorded CDs, DVDs, YouTube videos, photos, etc. There’s no going back and starting over so I’ll just have to be content with better late than never.